Deeply nourish and banish brass with this purple toning masque created specifically for blonde, silver or highlighted hair. Use once a week, or as toning is needed, after hair has been shampooed with The Perfect Blonde Purple Toning Shampoo. Leave on 5 minutes, rinse and reveal your perfect blonde! 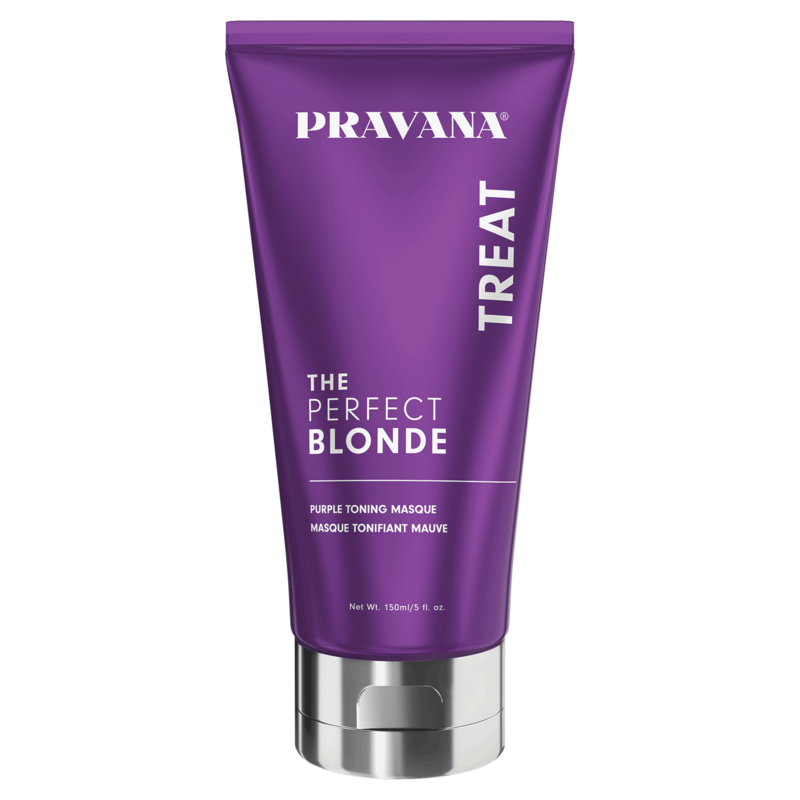 Replenish and revive dry, damaged strands while toning blonde, silver or highlighted hair with The Perfect Blonde Purple Toning Masque by Pravana. Thanks to its exclusive dual violet dye system and optical brighteners, this luxurious, deeply nourishing treatment instantly neutralizes unwanted yellow tones and kicks brassiness to the curb. Packed with coconut oil, The Perfect Blonde will add incredible shine, moisturize thirsty locks and infuse strength so that in less than five minutes hair transforms from brassy to sassy! Water (Aqua/EAU), Cetearyl Alcohol, Quaternium-91, Dimethicone, Amodimethicone, Glycerin, Theobroma Cacao (Cocoa) Seed Butter, Cocos Nucifera (Coconut) Oil / Gardenia Tahitensis Flower Extract, Equisetum Arvense Extract, Rosmarinus Officinalis (Rosemary) Leaf Extract, Loeselia Mexicana Leaf Extract, Arnica Montana Flower Extract, Panthenol, Ethylhexyl Methoxycinnamate, Hydrolyzed Cotton Seed Protein, Hydrolyzed Soy Protein, Fragrance (Parfum), Ext. Violet 2 (CI 60730), Methylchloroisothiazolinone, Methylisothiazolinone.